Strawberry plants can be grown in garden beds as well as in containers, but they require proper nutrition and care in both circumstances to stay healthy. Unhealthy strawberry plants develop yellow leaves, one of the earliest symptoms of a number of problems with the growing conditions of the plant. Strawberry plants can suffer from nematode infections, which create yellow leaves on the plant. Nematodes are worms that cause severe damage to strawberry plants, especially if present in very high numbers. They are small round worms that cause knots on the roots of the strawberry plant. Nematodes cause the leaves of the strawberry plant to yellow. Other symptoms include stunted growth, wilting, and fewer berries. Nematodes are very difficult to get rid of, and the best option is to purchase and plant only nematode-free strawberry plants. Verticillium wilt is most severe in the first year of strawberry-plant growth. Verticillium growth first exhibits itself in the older leaves of the plant, turning yellow and brown between the veins of the strawberry plant leaves. 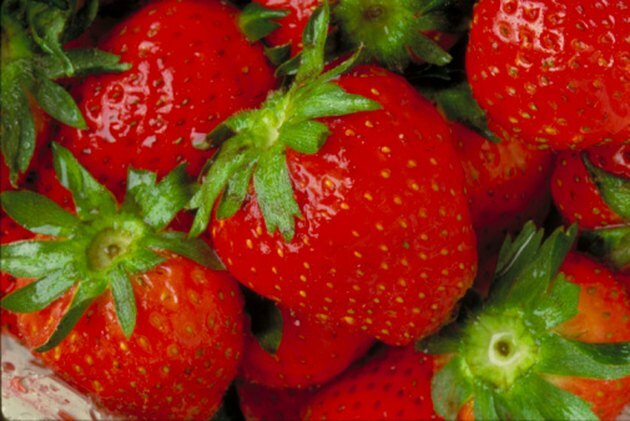 Verticillium wilt takes root best at the onset of hotter, drier temperatures, when the strawberry plant may become more stressed due to inconsistent irrigation. Water your strawberry plants daily to ensure a minimal degree of stress during temperature changes. Overwatering your strawberry plants will cause the leaves of the plant to turn yellow, as an indicator that the growing conditions of the plant are causing undue stress. The soil of the strawberry plant should be damp and moist when touched just below the soil surface. If the soil is waterlogged, saturated or very wet when touched before watering, the strawberry plant has been overwatered. Strawberry plants need only an inch of water per day, unless grown in very warm conditions. When there is poor soil nutrition, strawberry plants develop yellow leaves as an indicator they're not receiving proper nutrition. If the pattern of yellowing on the plants is distinctive — for instance, yellowing occurs near the top of the plant first — then it's likely your strawberry plants need additional nutrients. Use a soil-test kit to determine what nutrients are low or missing. Mixing in compost into the soil before planting your strawberry plants can help ensure healthy growing conditions prior to planting.